Cute Food For Kids? : Pink Shirt Day- Bullying Stops Here! Pink Shirt Day- Bullying Stops Here! "Pink Shirt Day began in Nova Scotia in September 2007 as 'Stand Up Against Bullying Day' when a high school student arrived at school wearing a pink shirt. He was swarmed by a group of about 10 kids who called him gay and threatened to beat him up. Two older students, David Shepherd and Travis Price, witnessed the event and the next day showed up at school with 75 pink shirts, a pink basketball and material to make pink head and arm bands to spread around the school. Within 2 days, over 400 kids wearing pink. The bullies were made powerless." From Sir Charles Kingford- Smith Elementary newsletter.
" Pink Shirt Day- Bullying Stops Here" is taking place on Wednesday, February 23rd, 2011. Please show your support by wearing something pink on that day. I'm trying my best to support this event. My biggest challenge now is how do I convince my husband to wear something pink on that day. any suggestion? Also, please share this message with your friends. Hopefully there will be more people join this event. Thank you everyone! Let's kick bulling our of our school yard! For more info, go to Pink Shirt Day. 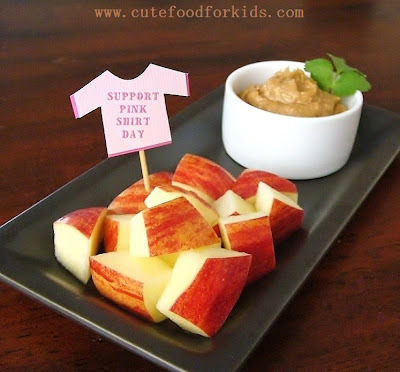 Eventhough there is sugar in this recipe, I still consider this is a healthy snack for kids! Since this recipe is so easy, don't make too much at a time. Also, the dip tast better after chilled in the fridge for half an hour!